I have been in somewhat of a blogging rut lately. I've been participating in my weekly little link-ups which is all fine and dandy, but I just couldn't muster up any good writing material. Not saying that my previous entries have been good... But it was at least stuff that I felt was worth writing about. My brother and his family recently came back to the mainland from a four-month temporary duty at Pearl Harbor (jerks!). Josh and his lovely wife were going to a Christmas party on Friday night and asked if my little sister, Rachel and I would watch the kiddos while they enjoyed some adult time. When we arrived, the kids were doing what they do best. Both Kennedy and Riley love to sing and dance. Riley can shake his booty like no other toddler I've seen. Kennedy kept insisting on Lady Gaga videos, and after some deliberation - we decided that we could play the songs but would minimize the screen since most of her videos are weird and inappropriate for little tykes. I found Willow Smith's music video of "Whip My Hair" and Kennedy was not having it. She kept saying, "I don't like this song." So, Aunt Rachel and Aunt Lauren put their pony tails on the very top of their heads and began to "whip it." Kenny started to like it more. And then insisted that like her aunts, she wanted a high pony tail and to whip it too. So we gave her one and she did. But the pony didn't last long. The music video ended and I bet you can guess what little miss was singing and bopping to. 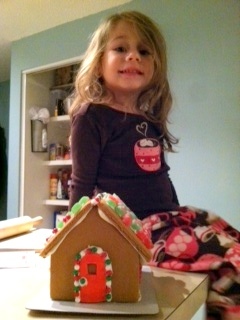 Haley had bought two gingerbread house making kits - one for Mia and the other for (mostly) Kennedy. Riley could help but we knew his interest in the activity would fade fast. I don't know any almost-two year old who is any different. The last (and only) time that I decorated a gingerbread house was in 7th grade. And I distinctly remember hating the experience because trying to put the house together was a seriously frustrating challenge, and then when trying to decorate it - the house would just fall apart again and I would have to start over. Now (by the grace of God, I'm sure! ), they have prefabricated gingerbread houses that are stur-dy and supply you with all the goodies necessary for decorating. 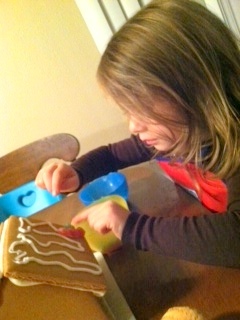 So, after the dancing, we commenced the gingerbread house decorating. 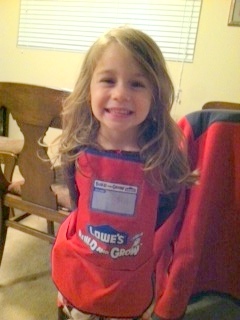 I thought Kenny should wear a little apron since we were going to be playing with frosting and other sticky things, and she was happy to oblige. She was so excited to get to decorate her house with the help of her Aunties. Riley was eager to help. And add to the mess and madness. I had to keep scolding Kennedy and Riley for putting the candy in their mouths and not on the gingerbread house. We certainly did not want to deal with the aftermath of a sugar rush. 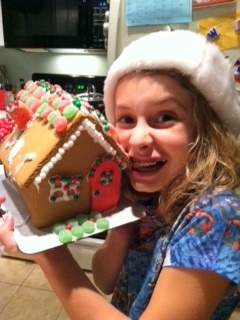 The girls were really happy with the outcome of their houses - and Rachy and I were impressed. 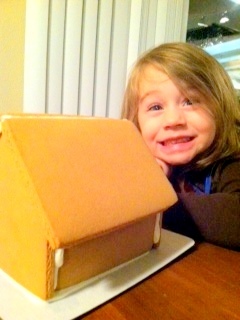 Gingerbread house decorating took us right up to bedtime. Aunt Lauren: OK, Kenny. It's time to get in bed! Say goodnight to Aunt Rachy. Kennedy: I don't want to go to bed. Aunt Lauren: I know, kiddo but if you don't - you know who can't come see you in two nights!! She scooted her little booty into her bedroom, grabbed a book, was read said book, and we didn't see her for the rest of the night. Mia only had to be told 23 times to get her jammers on and get into bed. Riley was fighting sleep like a mad-man but finally succumbed to the sandman when he and I got all snuggly on the couch together. He even put his chubby little hand on mine just before falling asleep.